Few Americans can save enough cash to buy a home outright, but plenty of low down payment options do still exist. The guide below gives you details about government-backed loans and private lending options. While you are looking for the best programs, you should also keep in mind the potential sources for down payments: 401(k) loans, IRA withdrawals, state and local grants, gifts from close relatives, and private loans or second mortgages. The three government programs that promote home affordability are FHA loans, VA loans, and RHS loans. The funds from these programs are not actually loaned from each agency; they are insured or guaranteed by the agency and loaned by a third-party. Continue reading for details on these no down payment and low down payment options. 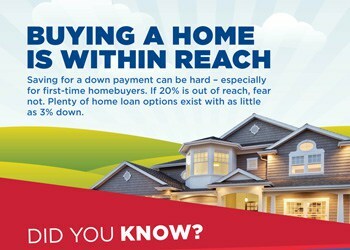 Low Down & No Down Payment Options Still Exist! FHA loans are insured toward the Federal Housing Administration and geared toward people with low incomes or minimal savings. By partnering with an approved lender, you can purchase a primary residence with few hassles. This program is open to you, whether you are a first time home buyer or repeat buyer. In addition, because FHA loans are insured, they are often easier to obtain financing, even for people with bad credit and bankruptcies. In general, the down payment for FHA loans must be at least 3.5% of the sales price. Borrowers should keep in mind, however, that down payments lower than 20% require additional private mortgage insurance (PMI). A second option is the VA home loan program guaranteed by the strength of the U.S. Department of Veterans Affairs. This program is open to veterans, active duty personnel, certain reservists and National Guard members, and certain surviving spouses. As long as you live in the home as your primary residence and the sales price does not exceed the appraised value, VA loans have no down payment requirements. In addition, you do not need to purchase PMI, and you do not need to be a first time home buyer. Similarly, RHS loans are backed by the U.S. Department of Agriculture and have no down payment requirements. These loans promote home affordability in rural areas. They help low-income households build or repair homes, purchase sites, and install water and sewage facilities. Applicants can make up to 115% of the median income for the area, but they must have reasonable credit and be able to afford total mortgage payments. Even if you do not meet the mortgage requirements for one of these three government programs, you can still buy a home with a low down payment. Many banks, credit unions, mortgage companies, and online lenders offer programs for low-income borrowers, first time home buyers, or people living in particular communities. You must be able to qualify under their mortgage requirements. Some programs even permit you to trade a higher interest rate for a lower down payment, while others roll part of the down payment and/or closing costs into the loan balance. Several low down payment options exist to give you a piece of the American dream. For more information on low down payment and no down payment options, please contact us or leave a comment below. We’d appreciate the opportunity to assist you!